Wouldn't it be great if you could create cloisonne jewelry elements right home and without any complicated equipment, hot metals, or melted glass? You can make a very close and convincing imitation of this ancient metal-working technique using polymer clay and resin. Let me teach you my signature Faux Cloisonne technique, which you will be able to use with any of your own designs. and above all – how to avoid and correct the most common mistakes while working with this technique. This tutorial includes 16 pages of instructions with more than 30 big full-color pictures showing every step and a complete list of tools and materials. 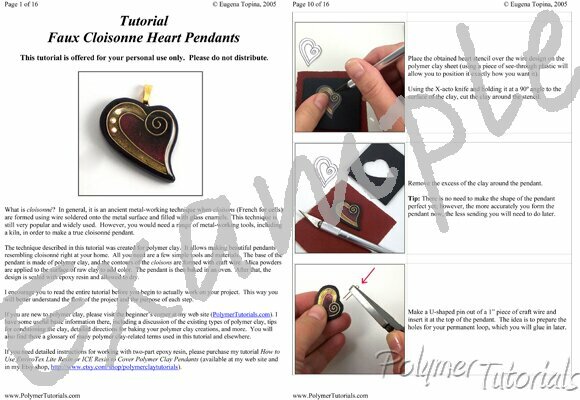 Bonus: 15 ready-to-use sketches for different faux cloisonne heart pendants. Note: If you need instructions for working with two-part epoxy resin, please refer to my separate and very detailed tutorial How to use EnviroTex Lite or ICE resin. By the way, if you are up to for more challenge with this technique, I have a more advanced tutorial in Faux Cloisonne series for you: Faux Cloisonne Brooch. The first picture on this page shows the project used in this tutorial to explain my Faux Cloisonne technique. Three additional pictures in this listing show some of my works done with Faux Cloisonne technique. These particular projects are not discussed in the tutorial offered here, but they demonstrate the possibilities of this technique. Place a mouse over the small pictures to see them enlarged. I purchased two tutorials from Eugena, and they are very wel ..